Equipped with five 6TB SATA 3.5" Enterprise NAS hard drives in its five 3.5"/2.5" drive bays, plus an additional five 6TB drives in the included x517 5-Bay Expansion Chassis, the ioSafe 1517 60TB 5-Bay NAS Array (10 x 6) is engineered to protect business-critical data, enhance recovery times, and deliver strong reliability while protecting up to 60TB of data from natural and man-made disasters. It is fireproof up to 1550°F for up to 30 minutes and also protects data from while fully submerged in up to 10' of fresh or salt water for up to 72 hours. Cloud-enabled and powered by Synology's DiskStation Manager operating system, the 1517 NAS includes apps for collaboration, file syncing and sharing, video surveillance, and more. ioSafe's 1517 has five drive bays, each of which natively supports 3.5" SATA hard drives, as well as 2.5" SATA hard drives and SSDs. It is powered by a 1.7 GHz Annapurna Labs Alpine AL-314 Quad-Core processor, which will allow you to run multiple functions simultaneously, while 2GB of DDR3L RAM will allow quick access to frequently used files and programs. Also featured are two USB 3.0 Type-A ports and two eSATA ports which allow it to be connected to your Windows or Mac system. Network connectivity is achieved via four Gigabit Ethernet ports with Link Aggregation and Failover support, or a separately wireless dongle for Wi-Fi connectivity. The 1517 runs on Synology's DiskStation Manager (DSM) operating system, which helps simplify managing your NAS, as well as accessing and sharing data. A variety of RAID modes are supported, which help provide users with data redundancy, speed, or a combination of both. Supported RAID modes include RAID 0, 1, 5, 6, 10, Basic, and Synology Hybrid RAID. For those who do not require a RAID, JBOD is also available, allowing each drive bay to be individually utilized. ioSafe has engineered this NAS to be energy efficient. Not only does it use dual 80 x 80mm fans to help keep the system running cool, the server supports numerous scheduled power on / off cycles and hard drive hibernation to further minimize power consumption and operational expenses. The 1517 operates on 100-240 VAC at 50/60 Hz and includes an accessory pack, a 200W AC power adapter, an AC power cord, and two RJ45 LAN cables. Protection is provided by a limited 1-year hardware warranty, along with one year of ioSafe's Basic Data Recovery Service (DRS). DRS includes free in-house data recovery, up to $5000 per TB coverage for third-party forensic data recovery services, coverage for servers or other devices attached to the ioSafe 1517, and advanced replacement of the ioSafe 1517. 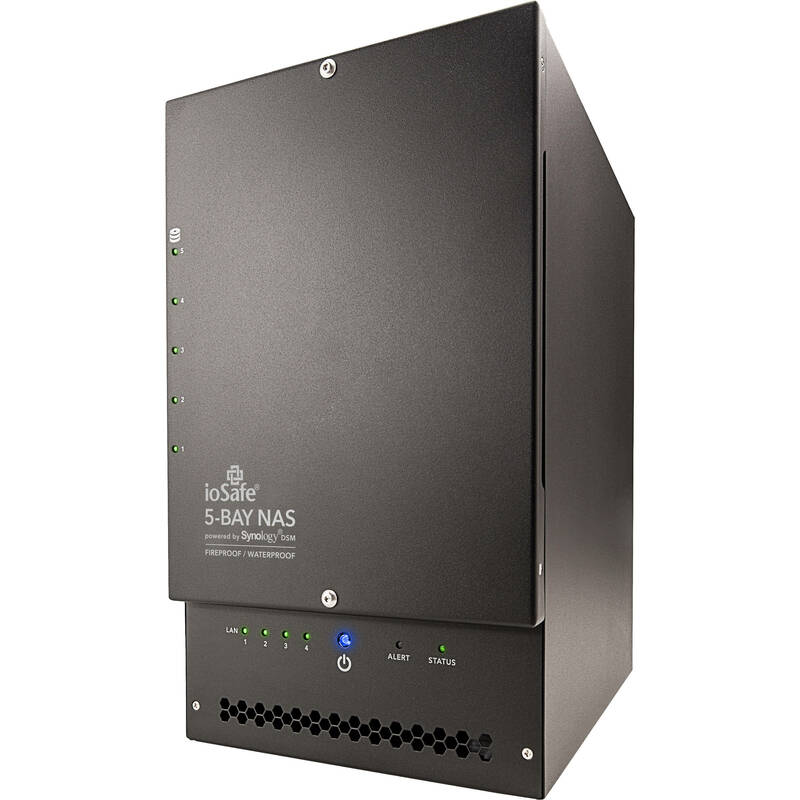 Purpose-built to keep on-premises data safe during building fires, the 1517 NAS protects data from temperatures up to 1550°F for 30 minutes per ASTM E119. Designed to protect data from floods, sprinklers, and fire department's hoses, the 1517 keeps data safe during periods of complete submersion in fresh or salt water up to a 10' depth for 72 hours. Optional floor and rack mount kits enable the 1517 to be bolted down to protect against theft. Additionally, the kit enables access to the ports and drive bays to be blocked to prevent tampering. Maximize uptime and minimize costly service interruptions. Synology High Availability (SHA) makes it simple to combine two NAS servers into a single high availability cluster with automatic failover. Keep data safe and secure with military-grade hardware encryption, built-in vulnerability scanning and remediation, secure data transmission, login protection, and more. Use the 1517 as a secure backup target or as primary storage with data backed up to another ioSafe or Synology device, an rsync server, Microsoft Azure, S3-compatible storage, or other cloud services. Easily and securely synchronize data across PCs, Macs, iOS and Android devices, and other NAS with either one-way or two-way syncing that supports file versioning, point-in-time recovery, compression, and encryption. Share files easily, quickly, and securely across multiple platforms with optionally password-protected or time-limited download links and built-in support for FTP, WebDAV, CalDAV, and CardDAV services. Protect your home or business. Create an easily managed, reliable, and intuitive monitoring system that delivers secure storage for recordings. With Synology Surveillance Station, you can monitor streams from multiple cameras in real time and manage and analyze recordings. Mobile support enables you to take proactive camera control on the go using iOS or Android devices. With support for more than 6000 IP camera model and integration with with I/O modules and door controllers, the 1517 can be used to build a complete security system for your premises. Boost productivity. Synology Office enables you to create documents and spreadsheets, work collaboratively, chat with colleagues, and is compatible with Microsoft Word and Excel. Includes a standard 1-year hardware warranty with ioSafe's Pro Data Recovery Service (DRS) that covers the cost of third-party forensic data recovery up to $5000 per TB. ioSafe's DRS Pro also includes free in-house data recovery, coverage for servers or other devices attached to the ioSafe 1517, and advanced replacement of the ioSafe 1517.